Interestingly, The Times has picked up on the theme we first raised on Sunday, about the forthcoming global grain shortage. 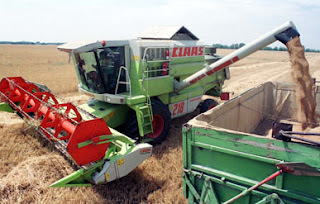 Headed, "Grain crisis spells end for empty fields", it tells us that the EU, rather belatedly, is to propose scrapping set-aside, which currently keeps one tenth of arable land out of production as a measure to curb over-production. It seems that Brussels has its finger on the pulse as always. Soaring wheat prices and predictions of a weak EU cereal harvest are causing alarm bells to ring in Brussels, especially as the EU's buffer stocks have shrunk from 14 million tons in 2006-07 to just 2.5 million tons. But, while the commission reckons that removing compulsory set-aside would liberate up to 10 million acres and add between 10 million and 17 million tons of grain next year, and so ease pressure on the cereals market, this will not even begin to compensate for the amount of agricultural land that will have to be devoted to energy production to meet the EU's renewables obligation. This is especially the case as, far from being "empty fields", much of the "set-aside" is devoted to producing "industrial" crops – mostly for energy generation and bio-diesel. This is permissible under the EU rules. Thus, as Defra has already warned set-aside land turned over to food production will mean a loss of energy production, which will have to be made up elsewhere. This will have to come from existing arable land used for food production, as the EU's Single Farm payments rules do not allow new land to be brought into production. The scale of the general problem is acknowledged by The Times which states that biofuels are creating havoc in an agricultural market where the impact of industry has in the past been minimal. It cites the International Grains Council predicting that industrial use of grains will rise by 23 percent to 229 million tons in 2007-08, with 107 million tons absorbed by ethanol producers. However, not yet has the paper noted the potential inflationary effects on the UK economy of the push towards greater biofuel. Nor does it note that the EU is poised to run contradictory policies, one promoting food production, one "conservation" and the other energy. But that is what we have come to – different parts of the system working against each other.